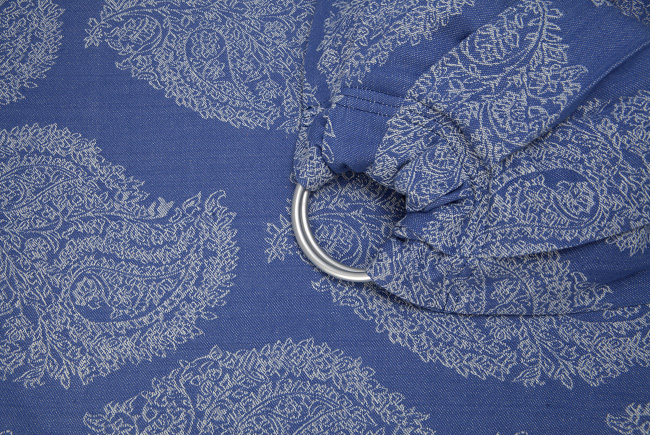 The Diva ring slings are produced from Diva wrap fabric. They are designed in Italy and produced in Portugal. The rings are sewn to the fabric with a pleated shoulder, with several pleats folded in one direction. The ringslings are made with top quality aluminum (lead and nickel free) sling rings specially designed and produced for babywearing. The rings are WELD FREE which is crucial for babywearing: anything that is welded has a weakest point so the rings can break. Besides the weld is not smooth and it can weaken the fabric in wear. The Diva sling rings were tested (by SGS) to a breaking force of 1247kg (2750lbs)! Standard big rings are used for all blends except bamboo: 3" inner and 3,5" outer diameter. We use small rings for bamboo blended fabric: 2,5" inner and 3" outer diameter. Diva ring slings have a nice carton pack and an instructions leaflet.